A canteen staff member of Cluster Innovation Centre (CIC), University of Delhi, was allegedly attacked by a group of students from Delhi School of Journalism (DSJ) on 25th September 2018. This incident has triggered apparent hostility between two institutions that are housed in the same building of University Stadium. Around 4 p.m., after the Chhatra Sangarsh Rally held on the same day, a group of students from DSJ had come to the canteen. According to Udit, an eyewitness and a student of CIC, the DSJ students hadn’t thrown the plastic plates and cups in the dustbin after eating. When Sanju bhaiya (canteen staff) asked them to, the students got aggressive and started abusing him. One of them then threw a napkin holder at Sanju, which barely missed his eye,” he added. This agitated the canteen worker, who jumped off from the counter and stepped towards the boys, following this a huge fight broke out. Later Sanju had to seek medical treatment at a hospital. However, according to the students from DSJ it was the canteen employee who had provoked them. Prashant Yadav, a student of DSJ who was involved in the violence, explained his side of the story to DU Beat. “After the rally, we were all tired and having our food. The canteen employee started rebuking us for occupying space. We talked to him politely but he spoke in a very disrespectful tone. He said something, and in response we said something. We are not happy with the turn of events and whatever happened was unfortunate, but we aren’t Gandhi ji’s disciples. We also paid the amount, in fact, we paid more than what was due.” When asked about throwing a napkin holder at the canteen staff, he explained that the napkin holder “wasn’t thrown deliberately but got flung accidentally”. DU Beat also reached out to DSJ students on DSJ Media Group but didn’t receive any response. “I feel betrayed and disrespected by the incident. We supported them in their fight for their rights. In fact, people from CIC were one of the first ones to lend support to their cause. It’s ironic that moments after joined them in the Chhatra Sangharsh Rally these people enter our own canteen and hurt our staff. We regret that we ever supported them. DSJ has lost a major ally and I hope they realise it soon,” asserted Shania Mohapatra, a second-year student of CIC. “We hope DSJ gets its rights, but more than that we hope they get a sense of decency. It wasn’t just some random students from an institute misbehaving, people who were at the forefront of the protests indulged in misconduct (Prashant Yadav had participated in the hunger strike). Instead of holding their peers accountable, the rest of the “leaders” of #StandWithDSJ movement are acting as an apologist for them. We aren’t saying you monitor every action of your classmates, but if you can share our solidarity pictures on your social media then you can also issue a simple statement condemning the shameful act of your comrades. To pretend ignorance is nothing but disingenuous,” said another CIC student. The following day, a verbal fight* broke out between the students of Cluster Innovation Centre and Delhi School of Journalism in the canteen. This happened in response to the action of some CIC students, who had torn off the #SaveDSJ posters from the notice board of the cafeteria in front of the DSJ students present there. Right after this, first and second-year students of CIC held a meeting with the Program Coordinator of BA (Hons) Humanities and Social Sciences to express their concern regarding the safety and security of the students. After much discussions and deliberations, it was collectively decided that the students will write an application to the Director of Cluster Innovation Centre, Dr. H.P. Singh, highlighting their concerns and asking him to take action regarding the issue. One of their demands includes barring the entry of the students in CIC who had hit the canteen staff. A formal application has already been forwarded by the teachers. As of now Prasant Yadav, Shabab Anjum, and Vipul have been identified as the offenders (the names are based on more than two student accounts and one teacher account, who identified the students based on photos and videos). DU Beat will update the report once we get an on-record quote from Shabab Anjum and Vipul. In the late hours of the afternoon, CIC students alleged that the DSJ students vandalised the Cluster Innovation Centre board placed on the ground floor. 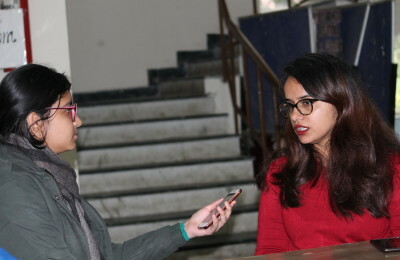 Disclosure*: Disha Saxena, a DU Beat correspondent, and Shania Mohapatra, a marketing executive of DU Beat, were involved in the verbal spat that took place. Previous PostHidden Gems of Poetry: An Ode to the Lesser Known Poets Next PostAre Universities Culpable of Glorifying the Indian Civil Services as the Only Viable Career?